Huge oil plumes may lurk below the surface of the Gulf of Mexico, scientists say. (CNN) -- While efforts to mop oil off the surface of the Gulf of Mexico stretch into a fifth week, more potentially hazardous oil could be lurking below the surface in large oil plumes, scientists said Monday -- a previously unseen phenomenon they are eager to learn more about. The spill has become so serious that on Monday, eight U.S. senators called for an independent federal investigation of whether oil giant BP violated civil or criminal laws in connection with the oil spill. The plumes could mean that even more oil has gushed into the Gulf from an undersea well than previously thought, and the contaminants under the surface could pose additional environmental hazards. "Nothing like it has really ever been seen in the deep water of the Gulf of Mexico before," Samantha Joye, a professor of marine sciences at the University of Georgia, told CNN's "American Morning." "It's not only a large feature, but it's a very complex feature. There's a lot of vertical structure to it." At least one of the plumes is thought to be enormous. Vernon Asper, a professor of marine science at the University of Southern Mississippi, told National Public Radio in a story that aired Monday that the largest is "probably 15 or 20 miles long and maybe 4 or 5 miles wide." Asper and a group of researchers spent about two weeks aboard a vessel in the Gulf to study the oil. "We're clearly detecting something," Ray Highsmith, executive director of the University of Mississippi's National Institute for Undersea Science and Technology, told CNN. The plumes were detected using instruments dropped over the side of the research vessel, he said. "The evidence we have at this point is there [is] oil in plumes under the surface at this time," he said. 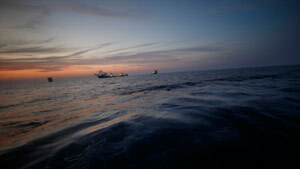 "The other theory is, the oil came to the surface and sank. That's what happened in the Exxon Valdez case." Video: How are Gulf Coast shrimp faring? Joye said the plumes' exact size is hard to estimate, because scientists are still analyzing their oil content. The plumes are rich in color-dissolved organic matter, measurable with a special instrument, but other compounds besides oil leave signatures on the sensor, she said. Samples from the plumes arrived at a lab Sunday night, and scientists will be scrutinizing them over the coming weeks to get a better picture of them. "It's not something we can explain. It's certainly not something we expected to find," Joye said. "We don't understand it." Highsmith agreed, telling CNN, "This is a very different spill than we've ever had before, and we need to learn as much about it as we can." The underwater gusher began after an April 20 explosion aboard the drilling rig Deepwater Horizon. The explosion and subsequent fire caused the rig to sink two days later, rupturing the pipes and allowing oil to begin spilling from the well. BP, which was leasing the Deepwater Horizon rig, has said since the explosion that about 5,000 barrels -- or 210,000 gallons -- of oil have been gushing out of the well every day. The company says it reached that number using data, satellite images and consultation with the Coast Guard and the National Oceanic and Atmospheric Administration. Some scientists, however, believe the actual amount of oil may be larger. A researcher at Purdue University said BP's estimate is low and he believes about 70,000 barrels of oil are leaking each day. Steve Wereley, an associate professor in the mechanical engineering department, said he based his estimate on an analysis of video of the spill. And Ian MacDonald, a biological oceanographer at Florida State University, has compiled data showing that as much as 1 million gallons of oil a day may be flowing from the well. As of May 7 -- more than a week ago -- MacDonald estimated that 13 million gallons had been spilled in the Gulf, according to FSU. By comparison, the 1989 Exxon Valdez spill in Alaska is estimated at 11 million gallons. MacDonald used U.S. Coast Guard aerial overflight maps of the oil to estimate its surface area, "then applied standard guidelines to measure the thickness of the oil itself," the university said in a statement. "By combining the two, he was able to provide a revised estimate showing that the oil spill is far worse than originally believed." Asked about the oil plumes, Doug Suttles, BP's chief operating officer for exploration and production, told CNN that BP is attempting to get the data "and see if that can help us in how we're responding. I can tell you we're holding nothing back, absolutely nothing back, as we try to fight this thing." Asper declined to be interviewed by CNN on Monday, but said in an e-mail the scientists are working on a statement "that will present a cohesive story regarding our findings and our confidence in them." The plumes pose a threat to undersea life, he told NPR, because bacteria inside them decomposes the oil and uses up the oxygen. That lowers oxygen levels in the water, which could harm the sea life that depends on it. Bob Dudley, BP's managing director for the Americas and Asia, told NPR that the plumes aren't likely to remain. "Oil by nature, in its own specific gravity, isn't going to stay in a plume like that," he said. "It should rise to the surface, and then we'll be able to attack the spill in that way." CNN's Tristan Smith and Eric Marrapodi contributed to this report.